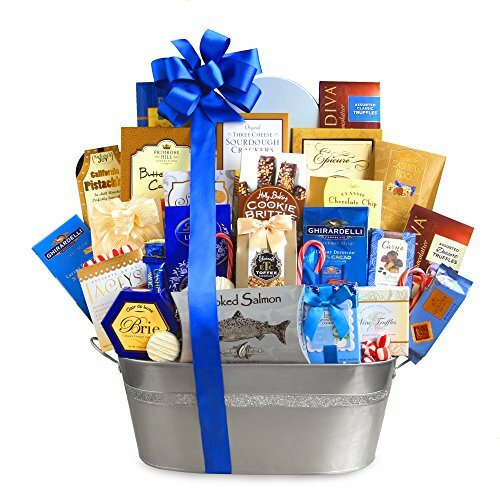 Send this special delivery silver and blue Gourmet gift and make them jump for joy this holiday season. A silver galvanized container sparkles and overflows with a long list of goodies that are perfect for sharing. Sweet treats include Lacey's cookies, a Ghirardelli Creamy Devotion chocolate bar, Lindt truffles, Butter cookies, Holly Baking Cookie Brittle, Elaine's delicious toffee, snowman cookies, truffles, Cary's English Toffee, chocolate chip cookies, Cashew Roca, Epicurean cookies, English tea cookies, a tin of white and milk chocolate-covered sandwich cookies, Godiva assorted dessert truffles, Godiva signature biscuits, a bag of Ghirardelli milk chocolate squares, Godiva assorted classic truffles, classic candy canes and delicious peppermints. Savories include brie, California pistachios, sourdough crackers and smoked salmon. What a feast!